Magic Toy Factory is an arcade game on www.bestgames.pk in which you will endeavor to collect various toys. There will be a space full of colorful balls. Your objective is to remove all the balls for getting toys. You have cannon and a train. Use the mouse to aim the cannon and click to fire the cannon. The cannon will shoot out balls of different colors. You must aim to match 3 of the same color balls, then these matching balls will remove from the space and become lovely toys to fall down, like fairy, teddy bear, car, ships, Rag Doll and so on. You can position the train to catch the falling toys. The color of the cannon will indicate the next ball color. You must clear all the balls to get to the next level. Because the balls will become more and more, you should finish it quickly. Are you ready? Join. Who can resist the temptation of a good cupcake? 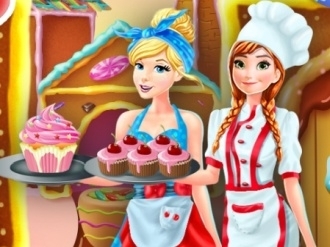 Come and play this new dress up game to discover what kind of outfit would fit better for these two princess in their trip to the cupcake factory. Either you'll choose to start shopping with Anna or Cinderella, make sure you create a perfect look for a day in Sweetland. Combine different accessories and match the hairstyle with their culinary look.